The consequences of a back injury can be devastating. Our no win no fee solicitors regularly see people who are no longer able to continue in their previous employment due to a back injury, and while personal injury compensation claims can help people deal with the financial repercussions of an inability to work, the emotional consequences can be severe. As a result, psychological problems are not unusual among people who make back injuries compensation claims. Accordingly, recent research from Friends Life to mark the beginning of ‘Backcare Awareness Week’ found that around one-quarter of people who suffer from back pain develop depression as a result of the injury, with longstanding clinical research revealing that chronic lower back pain sufferers are three to four times as likely to suffer depression than the general population. Furthermore, 26% of respondents to the Friends Life poll said that their back pain made them feel stressed, while 70% of people said it made them miserable. And the financial and career problems people often bring up in back injuries compensation claims could have something to do with this. The research found that 21% of back pain sufferers have had to take time off work because of this health problem. Of these, 39% had to take at least a month off, while 6% were off for over a year. These kind of extensive workplace absences are strongly associated with depression and other health problems, especially when the absentee is in such pain or is so immobile that they cannot even leave the house. 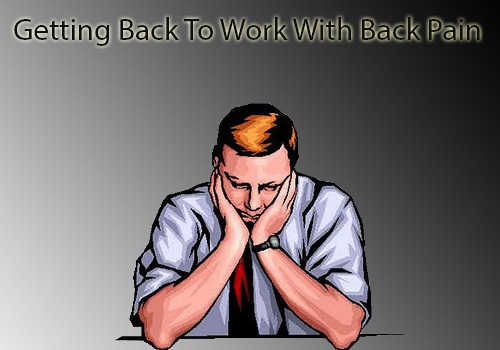 Therefore, it is important for people to get back to work as soon as they can after they injure their back. Some back injuries do not require any bed rest, and doctors will advise people to get back into work as soon as possible and to complete some small exercises to help them recover. Even people who sustained the back injury in an accident at work should try to return to work as soon as possible. Sufferers should talk to their safety representative or their employer to tell them they have suffered a back injury and to find out how they can return to normal working tasks without exacerbating the condition. Workers may be able to access occupational health support to help them get back up to strength. People have a responsibility towards their own health, but employers must not be negligent towards their duty of care towards their workers either. When dealing with an employee who has suffered a back injury, employers must perform risk assessments, act on any reports of work-related ill health and provide reasonable alterations to the workplace to ensure that the injury is not exacerbated. If they fail to take these steps, then they could be liable in industrial injury claims or could even be prosecuted under the Equality Act 2010. If you have suffered a back injury that was caused or exacerbated by someone else’s negligence, then speak with Clearwater Solicitors to start making a compensation claim.